On the sunny side! Welcome to 4 Monaloe Court! Located within a small enclave of houses off the Old Bray Road, is where you will find hidden this little gem. Enjoying the perfect sunny south west orientation and presented in walk condition, this beautiful mid terrace house is sure to appeal. Walking into this home you will be immediately struck by a lovely sense of space and light throughout. This property has been meticulously maintained by its current owner having recently been renovated throughout to include a brand new fully fitted kitchen and new gas boiler. Accommodation is well proportioned and extends to approx. 61 sq. m / 657 sq. ft., comprising entrance porch, living room and kitchen downstairs. Upstairs accommodation comprises two double bedrooms and a family shower room completes the accommodation at this level. A key feature of this wonderful home is the sunny and beautifully presented sunny south west facing rear garden. Stepping outside you are immediately met with an oasis of calm. The garden is fully enclosed and not overlooked. The garden is laid out mostly in lawn with a paved patio area ideal for sitting out and enjoying the all-day sun. There is private parking to the front of the house and ample visitor parking in the area. The location of this home is second to none. 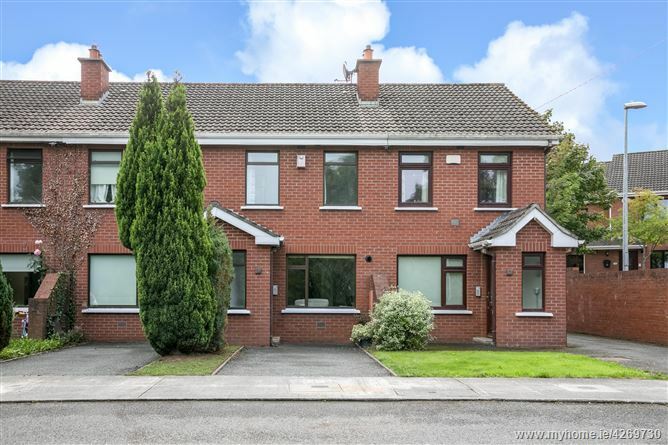 Cabinteely Village and Cornelscourt Village are within walking distance, while Cabinteely Park with its state of the art children's playground and nature walks is just minutes from this house. Local schools include St Brigid's Boys and Girls National School, Hollypark and Loreto Foxrock. Dunnes Stores Cornelscourt completes the picture by offering grocery shopping on your doorstep. The N11 and its quality bus corridor is minutes away as is the M50 and the LUAS at Carrickmines. If you’re looking to trade down, get on the property ladder or invest, you should come early to view this highly recommended property Features Beautifully presented two bed mid terraced home Presented in walk in condition. Enjoying the perfect sunny south west facing rear garden Recently renovated throughout Brand new fully fitted kitchen units and appliances New gas boiler. Double glazed windows throughout. Meticulously maintained by its current owners. Private parking to the front of the house Within walking distance of Cabinteely and Cornelscourt Villages Cabinteely Park on your doorstep N11 and M50 is minutes away. BER Details BER: C3 BER No.111410213 Energy Performance Indicator:216.4 kWh/m²/yr Accommodation Entrance Porch: Living Room: 5.3 x 3.8 Large room to the front of the house with electric feature fireplace with tiled surround and under stair storage. Kitchen / Dining Room: 3.8 x 2.5 Brand new fully fitted kitchen with fitted wall and floor units. Normende oven. hob & extractor fan, Normended fridge freezer, stainless steel sink unit, strip lighting and door to rear garden. Landing: With access to attic and hot press Bed 1: 3.8 x 2.7 Double bedroom with fitted wardrobes Bed 2: 3.8 x 2.5 Double bedroom with fitted wardrobes. Bathroom: 2.6 x 1.5 With w/c, wash hand basin , electric shower, tiled floor and tiled surround.